Employees who are working in the govt departments under the Telangana State are eligible to apply for the tests that are prescribed in their respective Departmental Service Rules. 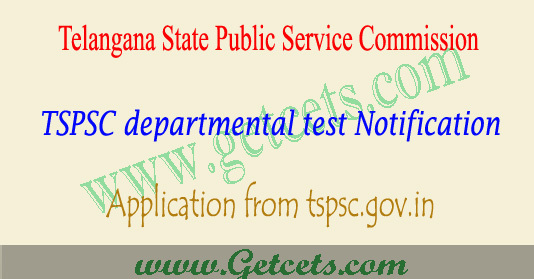 Complete eligibility details are given in TSPSC departmental test official notification pdf. The candidates are instructed to read the notification thoroughly before applying. For any details and clarifications the candidates are advised to visit Commission’s Official web-site http://www.tspsc.gov.in. STEP II: Fill Application Form – Applicant should fill in the Application through this option. STEP III: Know your Application Status – Applicant can check Application FeePayment Status through this option. STEP IV: Print Application Form (only after Fee Payment) – After Successful payment againstthe Application Form Submitted, Applicant can print the submitted Application form throughthis option. The Application is best viewed in Google Chrome Browser. 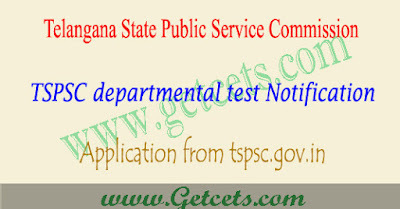 On your Browser type the website address “www.deptltest.tspsc.gov.in”, press ENTER button and you will see the following screen on your computer screen. Click on Registration link for Registering into portal as shown. After clicking on New Registration link, the following Registration screen will be displayed. Enter all the mandatory details and click on Preview button as shown. click on Submit button as shown. printout of the Receipt can be generated. Click on Modify Registration link, for modifying the details if they want as shown. details and click on Continue button as shown. and click on Modify button as shown. Click on Print Registration Details link, for taking the printout of the Receipt as shown. all the details and click on Continue button as shown. button for taking the printout of the Receipt as shown. Click on Fill Application Form link, for filling the application as shown. the details and click on Continue button as shown. once and click on Initiate Payment button as shown. Option then click on Pay Now button as shown. and click on Make Payment button as shown. After clicking on Make Payment button, the following screen will be displayed. will be processed at the earliest. printout of the Application Form as shown. The candidates are instructed to be careful while submitting the details at the time of submission of on-line application as the details once submitted cannot be amended at all. It is candidate’s responsibility that the details submitted are true and genuine. Representation or request in what so ever manner will not be entertained in this regard. STEP 1:-The applicants have to login to the website (www.tspsc.gov.in) and enter their particulars such as name, father’s name, date of birth and papers to be applied, Mobile Number, email-ID etc., in the Application provided. STEP.2:-Immediately on entering the above details, the applicants will get payment gateway. Preview and Edit facility is available to make changes and submit for proceeding to next step of making online payment of fee. STEP.4:-After payment of fee, the PDF Application will be generated which contains the particulars furnished by the applicants. The ID No in the PDF Application form has to be quoted for future reference/correspondence. The Applications received Online in the prescribed proforma provided in the Commission’s website within the stipulated time shall only be considered and the Commission will not be held responsible for any kind of discrepancy. Fee details : The Fee Payble towards application fee for each application (Each Test shall be treated as one application) to apply for the Tests mentioned in the Time-Table of this notification SHALL BE Rs. 200/-. However, no fee is prescribed for the Tests in Gujarathi and Marwari Languages. The applicants should pay Rs.50/- for each paper towards Examination fee in addition to the Application fee payable to the Secretary, T.S. Public Service Commission, Hyderabad through Net-Banking/IMPS/Debit/Credit Card from ** June 2019 to ** June 2019 .